Notes: This fine Norman Keep was built c1200 by Theobald Walter, 1st Baron Butler and completed by his son Theobald le Botiller c1220. The circular keep is over thirty metres high, and has a base of sixteen metres and is one of the finest of its kind in Ireland. The crown of mock crenellations and ring of clerestory windows were added at the instigation of Bishop Michael Flannery in 1861. The intention was that the keep would become the Bell tower of a Pugin-designed cathedral which was never built. 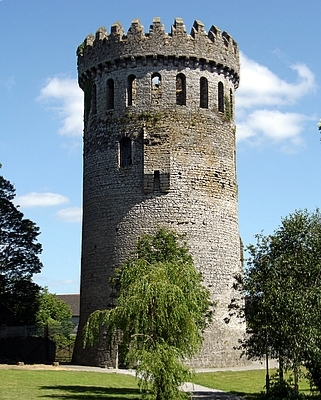 Though not true to historic character these additions have ensured the iconic status of the keep which ensures that it features on the logos of many local clubs and businesses including Nenagh Town Council. A project is currently under way to develop the castle and its surrounds. This project will position the castle as the main tourist attraction in the area.